Arete 5-Star, STC-Shaped Guitar from GJ2 Guitars. Grover Jackson, the luthier behind Jackson Guitars, has launched a new guitar company called GJ2 Guitars. 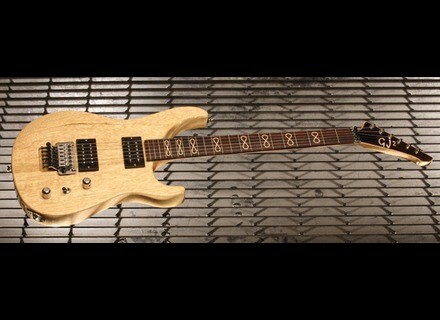 The company’s first model, the Arete, will be on display at NAMM 2012. After Jackson Guitars was sold to Fender, Jackson worked with a number of other manufacturers and operated his own contract manufacturing operation. Jackson has now made the decision to launch his own brand with CEO Jon Gold (formerly of Fender) heading up the business end. GJ2 is a small, three-man operation in Southern California, where all of the instruments—including the pickups—are designed and built in-house by Jackson. He plans on starting by debuting a single model with a variety of available features. The brand is launching with a single model, the Arete. Jackson said that he expects to bring additional models in the next 12 months. The Arete is available in two levels: 4-Star and 5-Star. Both share a sculpted, high-access heel; compound radius fingerboard (10”–14”); Habanero BW Neck V and Habanero BW Bridge V humbuckers; original Floyd Rose tremolo, Gotoh tuners; and neck-through-body construction with a three-piece center section. GJ2 offers H/S/S and H/S/H configuration on request. Guitars start at $2,999 for the 4-Star. Lehle DC Filter Lehle Gitarrentechnik has announced the new DC Filter.